Mandates of over 34.000 citizens willing to fight the storage of their telecommunications and movements over a period of six months ("data retention") were filed today with the German Federal Constitutional Court in Karlsruhe. The measure effective since Jan. 1st, 2008 is thus countered by the largest class-action lawsuit in German history. The complainants' mandates filling 102 folders and 12 packing cases were handed over to the Federal Constitutional Court in Karlsruhe today on behalf of Berlin attorney Meinhard Starostik. 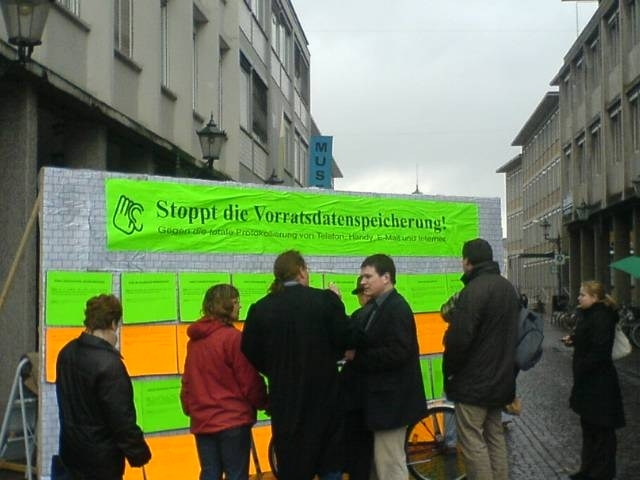 Afterwards, on the Platz der Grundrechte (Basic Rights Square), members of privacy NGO "Arbeitskreis Vorratsdatenspeicherung" (Working Group on Data Retention) symbolically nailed 17 theses for the defence of basic rights in modern times. For several rights a thesis each was put up such as: "The sovereignty of the individual over their personal data is a prerequisite to claiming one's liberties." Other panels read contrarian statements by politicians such as the German chancellor Angela Merkel who said: "There must not be any space in which terrorists can communicate without the possibility of government access." Comments the Working Group on Data Retention: "We demand that government and parliament initiate an independent review of all surveillance powers introduced since 1968 with regard to their effectiveness and adverse side-effects. We also demand a halt to new surveillance bills further encroaching on our basic rights. Among those plans are the surveillance of flight passengers, the central population register, biometric and electronic ID cards as well as police powers for the Bundeskriminalamt (Federal Criminal Police Office) including state spying into personal computers." In early February the German Federal Constitutional Court sent the application for the suspension of the data retention act to the government, both chambers of parliament as well as the governments of the Länder for comment. The court asked, among others, for confirmation of a study according to which even before data retention was enacted, merely 2% of the requests made by authorities could not be served by the service providers. The Federal Constitutional Court has announced it would decide on the application for an injunction in the month of March. A survey conducted by the Working Group on Data Retention in January revealed that many German citizens avoid using telephones, mobile phones, e-mail and Internet since the data retention act came into force at the beginning of the year - with grave consequences in sensitive areas such as journalism and medical counselling.